Last week I was watching Paula Deen's show where she was making polenta appetizers topped with sauteed mushrooms. The dish looks so great that I decided to replicate it. The recipe below is of my own invention--I did not feel like looking up Paula's original recipe. 1. For polenta, bring salted water & milk to a boil. Add thyme sprigs and 1 cup of polenta. Whisk pretty much constantly for the first 5 minutes. Cook for at least 20 more minutes. Remove thyme sprigs (most of the leaves would have fallen off by this point), add the shredded cheese and cook for a few more minutes. 2. Pour polenta into an oiled 9x13 Pyrex dish, cool slightly, and refrigerate for at least 2 hours. 3. For the topping, add bacon and onions to a pan. Brown. 4. Add mushrooms and thyme sprigs. Season with salt & pepper. Cook until mushrooms are soft and caramelized. Remove thyme sprigs (again, just like in polenta, most of the leaves would have fallen off by now and you'd just be removing the sticks). 5. Optional: add braised lamb...I had some left from a meal at Lebanese Taverna. 6. Back to polenta...Once the polenta is all set in the refrigerator, cut out round shapes using a biscuit cutter. Bake those rounds in a preheated 375 degree oven for about 10 minutes on each side. Top them with mushroom/onion/bacon/lamb mixture. Serve. Note: the pictures above are not technically of the final dish. I was serving this dish for dinner and the lighting was rather poor. So instead, I tried to saute a few of the polenta rounds during the daylight. That wasn't the smartest decision because the polenta started losing some of its shape. The taste, however, was still awesome. Note 2: I LOVE polenta. My mom used to make polenta with feta for breakfast when I was growing up in Russian...great memories. I've only ever used polenta as a baking ingredient. I'd love to try it in this form. Excellent pictures. Next day polenta cakes are a fave. Love the bacon and thyme in this dish. What a beautiful looking dish. I can see how this would be perfect for entertaining. And you can't go wrong with bacon and mushrooms. ha, it seems like there is ALWAYS something food-related on cable tv these days. even the travel channel does food shows. 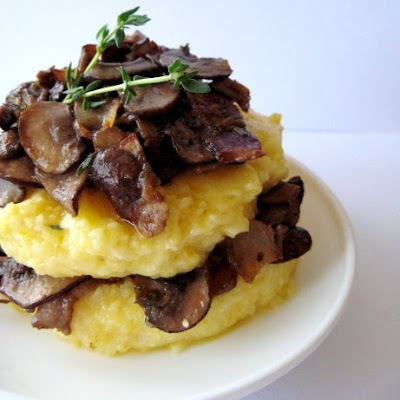 Your polenta and mushrooms look delicious. I have a recipe for polenta that's made in the oven and doesn't not require stirring. It's on my site if your interested. It will give you more time to watch food programming :-). Looks delicious! I've been looking for fun new polenta recipes since I have a giant bag from my last polenta experience! 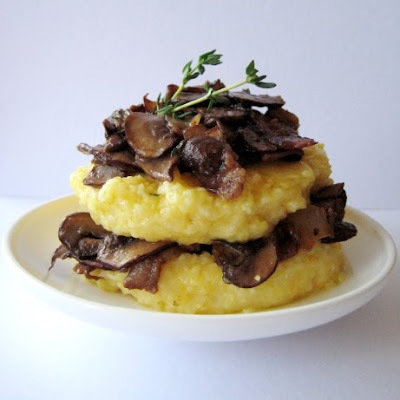 Haven't had polenta OR mushrooms in a long time...putting this on the to try list! we never cook with Polenta in the house. Its not a regular but I would like to try this recipe some time..
OMG..this looks amazing!!! TOTALLY AMAZING! I miss the Food Network! We need to get cable again. =) This looks really good Olga! What? Polenta & feta in Russia? I didn't know such ingredients existed until I came over here. Oo that looks good! Polenta is - for whatever reason - not something that is very well known in Holland. I have to go to a specialty store to buy it so I've never really tried making it myself but this does look very tasty! MMMMMMM,...your polent dish looks stunning!! Just lovely & so healthy too! Urgh! That looks so good I could eat my computer. You saved me some leftovers, right??? I'm the only one in my house who likes either polenta or mushrooms. I did it Olga, I made polenta. Thanks for the encouragement.